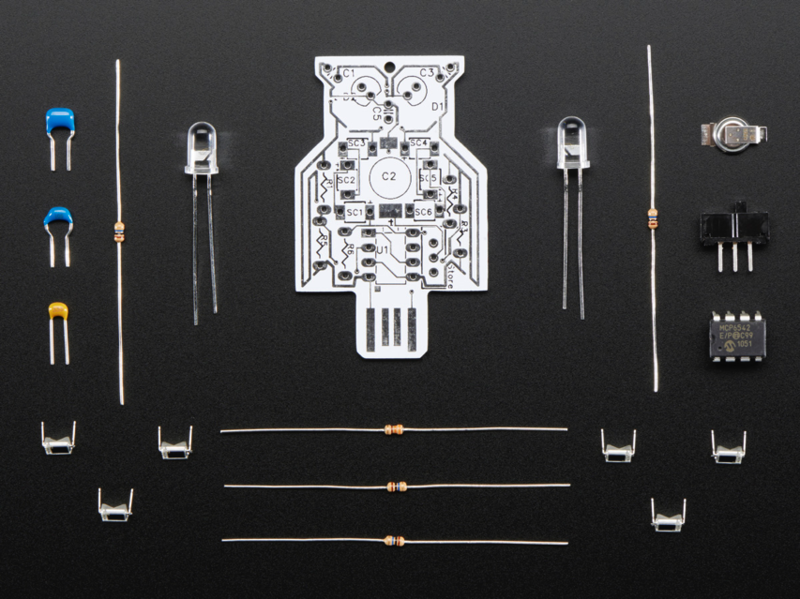 NEW PRODUCTS – Solar Powered Owl Blinky LED Pendant Kit from Lumen Electronic « Adafruit Industries – Makers, hackers, artists, designers and engineers! This is the Solar Powered Owl Blinky LED Pendant Kit from Lumen Electronic! With a little bit of soldering you can make a battery-less blinking owl. That’s right, there’s no coin battery! Instead, a 1 Farad super capacitor is used to store energy. It takes around an hour to make and, when you finish, you can charge it either with a USB or with the power of the sun. It takes less than 2 minutes or so to fully charge through the USB and 15 minutes from direct sunlight. In darkness, it’ll last for almost 90 minutes – making it the perfect accessory for forest séances with your witch friends or indoor Owl City concerts (you can charge it during the opening act). The pendant comes with instructions for assembly as well as a schematic and parts list. There are also detailed assembly instructions online here!